Announced during the International Tokyo Toy Show event Kaiyodo in partnership with Dreams Come True has released the official images of the Revoltech Teenage Mutant Ninja Turtles. The figures will be released this September for 4,800 yen each. What is cool is that the sets come with other environment accessories such as manholes and more. 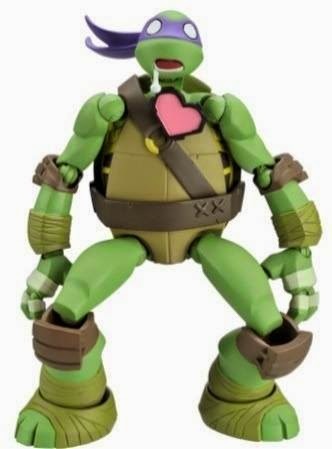 Leonardo is ready to rock right out of the box, with an insane level of articulation (including his fingers! ), his trademark katanas and scabbards for each, an extra "shocked" head, the all-important pizza, and a manhole-cover stand. Raphael is inclusive of his trademark sai, an extra "angry" head, and a manhole-cover stand. Donatello comes with his trademark bo staff (with or without blade), an extra "drooling" head, and a manhole-cover stand (with fire hydrant). Michelangelo is inclusive of his trademark nunchaku, an extra head with a very pleased look, and a manhole-cover stand.